Another year of on track disappointment wasn't enough to dampen the spirits of those in Maranello today as a whole gaggle of Ferrari drivers donned their santa robes on Saturday for the traditional end of year Ferrari Christmas party. 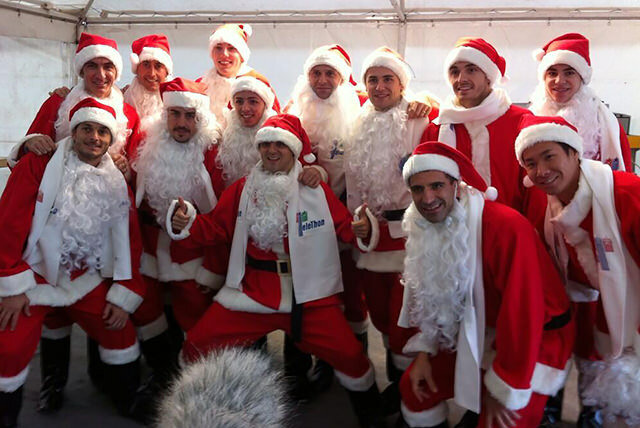 The event, put on for the workforce in Maranello, often sees race drivers and team members dress up for the occasion, and as this year is Felipe's last with the team Santa Massa rightfully took centre stage. Also dressed up for the occasion are Alonso, Bianchi, Fisichella, Kobayashi, Gene and a number of other drivers from various motor sport series (GT pilot Andrea Bertolini took the picture).